HARLEM is a bit similar to Jägermeister, but goes deep with flavor bringing something new to the market. 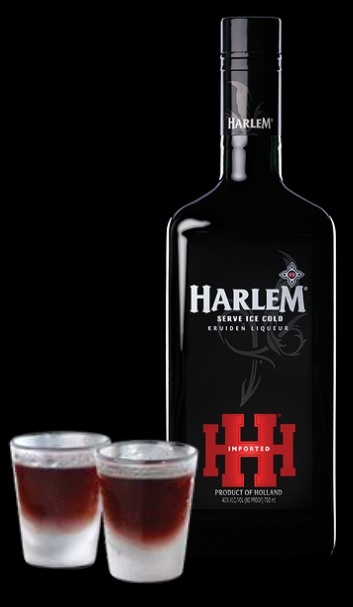 While the recommended way of consuming HARLEM is an ice cold shot, it is delicious straight or used to create cocktails. BourbonBlog.com is a fan of all HARLEM Kruiden Liqueur as we recently spent some time with HARLEM in Las Vegas, Nevada at the HARLEM Shot Showcase, we’re including video below, which includes our interview with he 11th generation distiller Carl Nolet, Jr. He is the man that was responsible for bringing Ketel One to the U.S. back in 1990. As Ketel One continue to have a serious impact on the way we drink, we predict the same with HARLEM! Here are our tasting notes on HARLEM Kruiden Liqueur..we’d love to hear yours below as comments. Color: Medium dark cola type color with some transparency. Notes: The word “Kruiden” is the word that the Dutch use to describe the herbs that give HARLEM is distinctive taste. Nose: Orange and citrus with herbals that strike “cool tones” between eucalyptus and mint. Taste: The flavor is very approachable yet more refined and distinct than other “herbal” liqueurs in the as same category. The citrus is strong bringing textures of fresh peeled oranges throughout the taste. It begins with a nice tang and ends with a lovely herbal roundness. It is not overly sweet, but a bit sticks to the tongue in smooth way. Finish: Bright and alive with candied orange.